8555 Santa Monica is a four & five-story pedestrian oriented building. New neighborhood-serving retail spaces will open on Santa Monica Blvd, with restaurants and cafes surrounding a beautifully landscaped open-air plaza. The second floor will feature live-work units, salon spaces and creative offices. Residential units will occupy a portion of the second level and the remaining three floors. The project is designed to comply with current zoning codes. In total there will be 97 apartments, including 15 units designated as affordable housing for individuals with very-low and moderate incomes. There are 323 parking spaces planned for commercial tenants as well as residents. 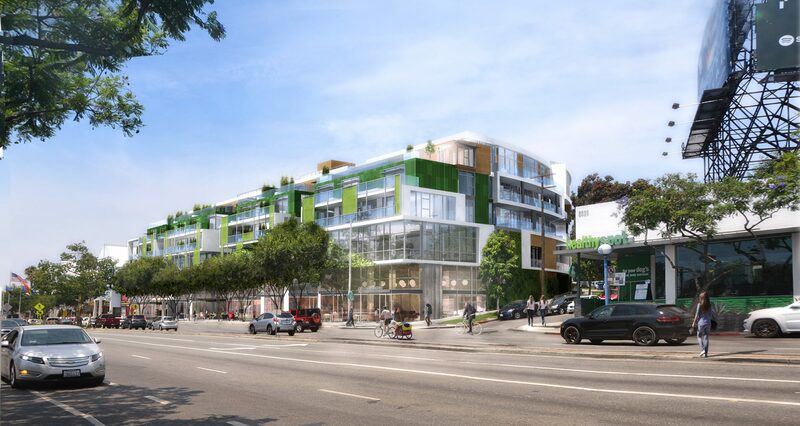 Located just a block from two popular Metro Rapid Bus lines along both Santa Monica and La Cienega Boulevards, it is expected that a number of residents at 8555 Santa Monica will be looking to adopt a lifestyle prioritizing pedestrian, bicycle, and transit mobility. How will cars access the project? All commercial vehicles and loading, along with some residential vehicles, will enter the parking garage from Santa Monica Boulevard. Parking accessed from West Knoll is reserved exclusively for residents. What kind of open space? The project design includes substantial common and private open spaces in the form of terraces, patios, and plazas that are located on several different levels of the building, exceeding city requirements.